Last year, the Rhode Island Office of Internal Audit launched an audit of the University of Rhode Island’s Housing and Residential Life. The audit looked into the University’s policies and procedures, as well as fiscal policies. Collins was appointed to the University’s Student Affairs last July with more than two decades of experience, including running Michigan State University’s housing which is one of the largest in the country. The housing audit began with employees contacting the anonymous hotline. Once the reports were brought to the hotline, the University launched an internal investigation into the matters. However, the state of Rhode Island, in an effort to improve efficiency, decided to get rid of internal audits. As a result the state auditors picked up where the University left off in its investigation. The audit not only found problem areas, but also provided recommendations and a timeline of when to solve the recommendations. Three of the main problem areas stemmed from policies, fiscal concerns and the consolidation of housing systems. In terms of policies, the audit discovered in some cases there was an absence of written policies and also found ways to rework existing policies. The audit served to provide a “check and balance” for fiscal matters, which discovered that the University overbilled students living in the Roger Williams Residential Complex. The third was the consolidation of undergraduate and graduate housing systems. Collins strengthened the idea that the University is working on not only correcting the mistakes, but also in preventing them. Student Affairs launched a policy and procedures committee to oversee and implement policy and procedure changes. Another main problem, that the University has already fixed, is that of the Roger Williams overbilling. Within the next day after the audit was released, URI refunded all of the overcharged students. The third main area is the work in consolidation in the two housing areas, which Collins says will be complete by July 1. “I’m very thankful for the audit, I think it allows us to be better at the work that we do and creates opportunity for us to improve our practices and for that I am very thankful,” said Collins. She wants to reassure students that this is her expertise, and one of the reasons she was appointed to the position. Collins said she wanted everyone to know that the future for housing is bright. There are many projects beginning for housing, including the construction of a new upperclassman dorm, a 125 seat café and a bike path that attaches to the bike paths in Narragansett. Housing will also be continually evolving and changing under Collins’ guidance. 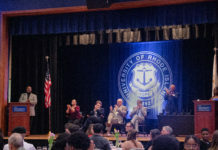 There are plans to host a conference for the Association of College and University Housing Officers – International to come down to URI to provide feedback and guidance to the University’s housing systems. Housing also has plans to implement new technology and software changes, including revamping the record keeping for health and fire safety inspections.